When I first got this project, I didn’t really know what to do about it until I thought about it. We had to go 10+ meters for an A+ and just 5 meters for a C passing grade. And the car had to be a certain size width and length. The products I used are the perfect size for the project. I didn’t know what to do as most people already had a group because I was absent that day, so I gathered 2 people and built the project myself. 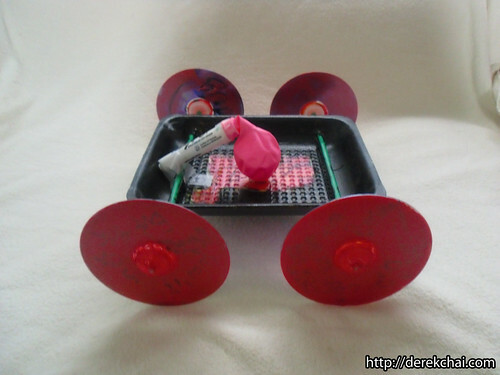 I needed to make the car aerodynamic and make sure that the wheels move smoothly and have as little friction as possible. After spending a day or two brainstorming, I finally figured out the best materials for my project. Unfortunately I do not have a video of the car running, but I can assure you it ran really smooth and fast. Just a heads up, there are cars that are lighter, this design for a car is on the heavy side, it was one of the heaviest but one that went almost went the farthest. Saw to cut the stick to fit your straws. Tools to help you create project. If for some reason you are unable to find the sticks at home depot you can replace some of these materials. Thinner straws instead of Starbucks/McDonalds Straws. For my project I used the big stick and the Starbucks straws, there were some other groups that used thin straws and skewers who were able to go farther than me. I am not going to go in depth with a picture tutorial but I will provide pictures at the end which should give you an idea on how to create this car. Step 1: Get the expo marker and some pliers and pull off the top of the maker and take out all the ink and the felt tip. Once you do that go to a sink and use soap and rinse it out and make sure it is clean as you will be blowing into the top of the marker. Attach the balloon to the top of the marker. I chose to use this method for releasing the air because the air comes out very powerful due to the reduced size of the tip and at towards the end when the air is almost out, it gives the car an extra boost like a power up, which makes the car go several more meters. 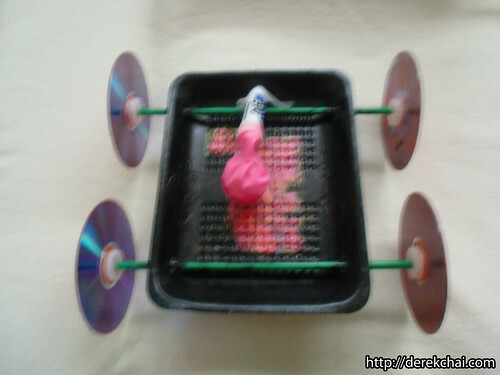 The only problem I had with this is that sometimes the balloon would float to one side and hit the wheels. Do not tape the balloon yet! Because you will need to change balloons often to keep them from being soft. Best thing to do is use a fresh balloon for your first trial and continue using it for the rest of your two trials. But do tape it when you are doing your trials. Step 2: Take your stick and your straw, and poke the stick through the straw and measure out around 3/4 inch to 1 inch for both sides and cut that portion off and do the same thing again so you have two sticks that are 2 inches longer than your straws, and make sure they are even. You may need to add a half an inch if your bottle caps are really thick. Step 3: Poke 4 holes at the side of the meat platter dish for the straws, make sure the are even and make them so that they are at the edge of the horizontal sides. Please refer to the pictures when doing this part. And poke the straws through to make sure they fit. Step 4: Get a nail and a hammer and the bottle caps and punch a hole through each one making sure that it is right in the center and isn’t too crooked. Then, poke the stick through and make sure that it can fit through. Next, take two bottle caps and put a CD in between and poke the stick through and do the same for the other side and make sure that everything fits. Be sure to put the bottle caps facing in like the way you take it off the bottle or else it won’t hold. After everything fits, take the bottle cap and center it on the CD where the hole is and hot glue the side. Let it dry before proceeding. DO NOT ATTACH THE STICK YET, JUST THE BOTTLE CAP. Next take the other bottle cap and put it onto one side of the stick do the same facing, then, you poke the stick through the hole on the bottle cap that you just hot glued onto the CD, now you must use a table or something hard like the floor to make sure everything is straight before gluing the bottle cap on the inside to the CD. Once everything is straight, glue it down and make sure the wheel is not crooked. Do the same thing for the other wheel. 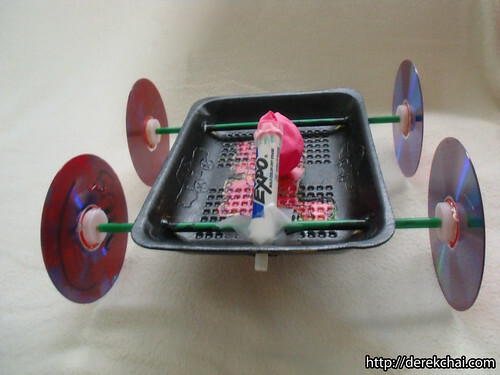 Before doing the next step, if you have extra CD’s, I recommend making a trial set of wheels before attaching it to the body of the car to make sure you are able to make the wheels straight and not crooked and so that they can roll straight without much friction. 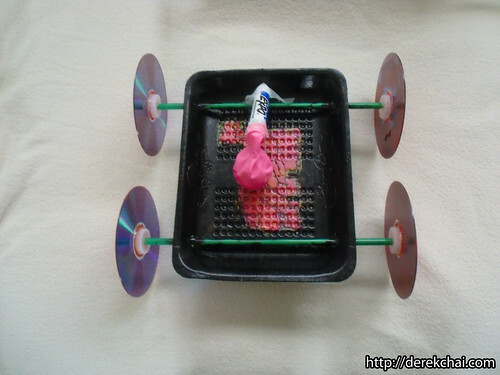 Step 5: Next, you take the straws and put them through the foam dish and for the other set of wheels you do the same thing as you did with the first side, except you poke the stick through the straws first before you glue them down. Be sure that the CD/Bottle Caps are sort of touching the straws and make sure that they are straight. Step 6: Poke a hole near the bottom of the foam dish just big enough for the expo marker and be sure it is facing down. That is about all for the steps for creating the project, I may have more to add but I really can’t think of much more steps that I took. The pictures should help a bunch. The car should be able to go 14-17 meters as that is what I hit almost every time. There were two cars that beat me, one was a piece of cardboard and they used thin straws and skewers. That car went 20+ meters and won. The second car was a light strawberry basket which did beat me by just a little but their car was not of the right size so they were docked points. All those projects were super light while mine was heavy. Wow, this is quite a long post, I have more to talk about but I won’t bog down the post with what happened on trial day. But I did try a smaller dish and putting the car upside down with the expo marker on top and both of them didn’t do very well but still went past 10 meters. If your project fails, I take no responsibility as I only post this for educational purposes. If you have any questions please post a comment and I will reply as soon as I get a notification. Again, I do not have a video. More Projects like roller coaster, bridge, and egg drop project coming soon. NextPawn Stars the Game Price List – Cheat [OCT. 2] – UPDATED REGULARLY! You need some skewers or a thin wooden stick which goes through the straws, then you can use hot glue and some bottle caps to attach the sticks to the CD.